Corofin produced an absolutely scintillating performance in the first half of the recent club final against Dr. Crokes. I threw up a few pieces on twitter (@dontfoul) around that performance and what follows is an amalgamation of those pieces with a bit more context. It is important to note what this is not. It is not is a critique of how Corofin play. It is a review of how they played in one half of one game. The first thing that jumped out when watching the game “live” was their shooting. 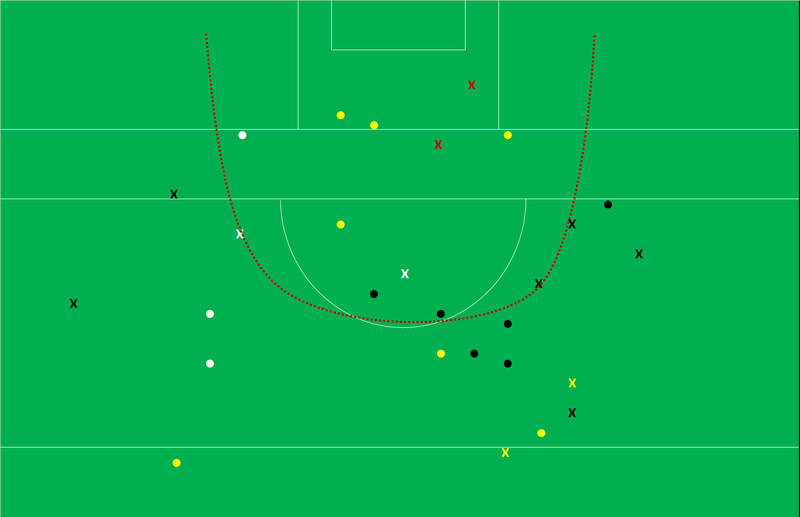 In that first half against Dr. Crokes they attempted 15 shots with none coming from further out than ~23m. That is an incredibly neat and tight shot chart. I tend to use an ad hoc arc around the D to give a visualisation of “inside”/”outside” shooting which I have overlaid on Corofin’s shots. In the Super 8s last year 45% of shots were taken inside that arc. 45%! 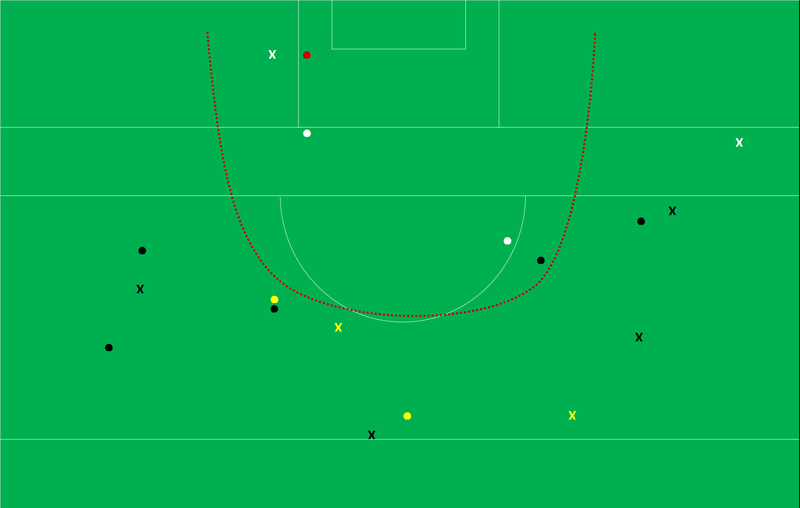 Corofin were at 87% (13 of 15) with the two “outside” being on the edge of the arc. Taking a step back the next question is how Corofin managed to create such a neat shot chart. Below is the passing sequence for all 18 of their first half possessions and the result for same (excluding the very last move when the referee blew for half time just after the kickout was gathered). Green is a successful pass, orange is where the pass did not go where anticipated but Corofin gathered/controlled the ball and red is a turnover from a pass. That is not to say that the other 124 passes were perfect – far from it. There is quite a bit of oIrange in there but that in and of itself was a feature. Twice shots were blocked and regathered, at least five times unorthodox passes (fist through, toe pokes, kick through – you don’t always need to “go down on it”) successfully found a Corofin player. Corofin were alert to all possibilities at all times. Visually Corofin were in utter control and the above table is just another way to show it. And that control was achieved with a variation in both tempo and style. The first three possessions took six passes apiece, contained two outfield solos and averaged ~20 seconds on the ball. The last point was a 20 pass string with five outfield solos and consumed 72seconds on the clock. That control was evident even with a heightened volume of kick passes. More work is (definitely) needed here but it is important to stress that it is the type of kick that is emphasised here rather than the volume. 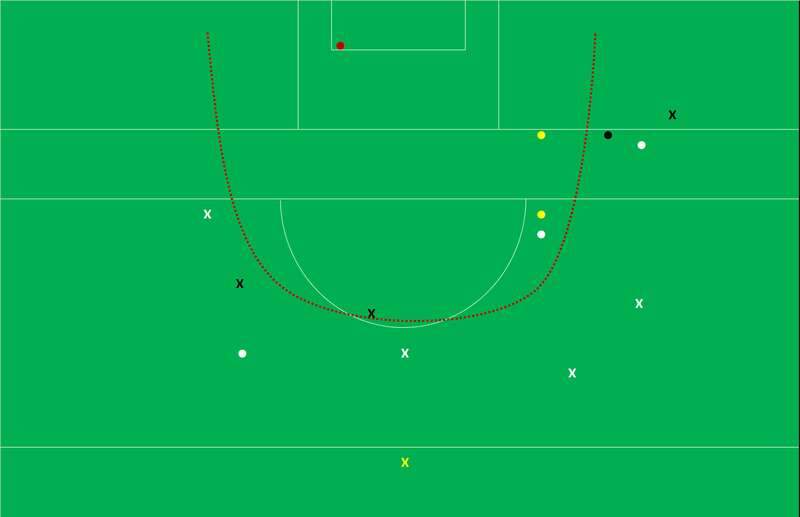 Corofin, at a 30% kick pass ratio, were just above these norms but their attacking kick passes were immense and it is phenomenal that they only had a 3% turnover rate on all passes when we overlay the (subjective) nature of their kick passing. So stepping away from the passing sequences (as I said you could create a thesis on this alone) the question becomes how they create this control. They are generally on point with their passing allowing them to attack the goal and almost point-blank refuse to take unnecessary shots. 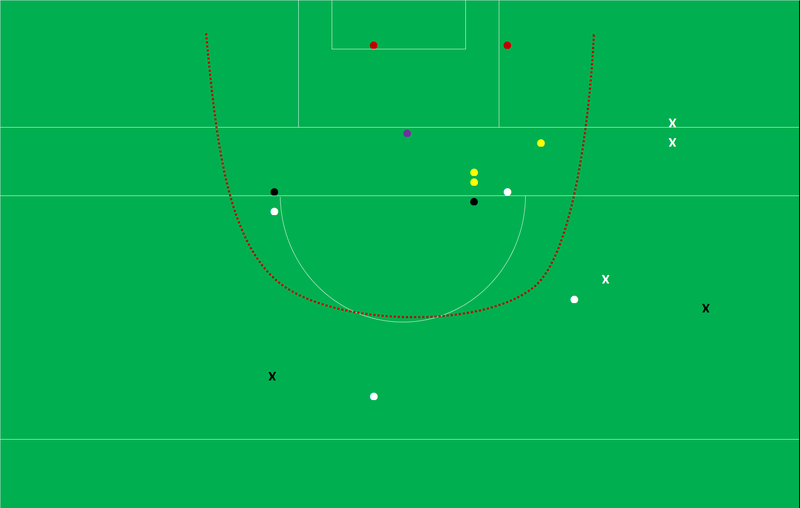 Joe Brolly eulogised on their understanding of movement and space in the Sunday Game and that got me thinking re how Corofin use their front six. But all that pales into insignificance when we see what the front six didn’t do. They stayed away from the No. 6 channel (yellow coloured rectangle in the above chart) altogether. Compare that to how other teams view the concept of space and where they try to get their playmakers on the ball. That first half display against Dr. Crokes was outstanding. Unfortunately (despite my endless invocations to people on Twitter to back up their data) I have lost my copy of the 2018 final v Nemo Rangers but commentary points to how they blitzed both Nemo in that final and Slaughtneil in 2016. What I do have however is the semi-final v Gaoth Dobhair. And the comparison of the two first halves is as scary as it is striking. Part of the narrative around Corofin’s displays in the finals is that Croke Park suits them. The wide open space allows their forwards to run all sorts of angles whilst the outfield players can find space to pick a pass. Scarily Corofin were even more clinical in the first half of the Gaoth Dobhair game, down in Seán Mac Diarmada Park, than they were up in Croke Park. I mean … 2 – 07 from 11 shots in an AI semi-final. Once again the shooting was very considered with only three shots coming from outside the aforementioned artificial zone (I wonder did Jason Leonard have to do punishment laps the next night at training for that shot out to the right ….). Across the two halves analysed that’s 81% (21 of 26) of shots coming from “inside” with only one shot that could be considered in any way away from the arc with 35% of all attempts from play being goal attempts. Again, a reminder that the 2018 Super8s saw 45% of shots from “inside” with 10.4% of attempts from play being goal attempts. The passing was not as slick as against Dr. Crokes in that seven passes led to a turnover but the avoidance of turnovers in the tackle is evident with just the one ball dislodged early on. All the main ingredients for that first half performance v Dr Crokes were evident in their first half display v Gaoth Dobhair. I have only ever used Championship games when creating specific averages or metrics. In the main this was due to laziness on my part as I wasn’t really tracking League games but there was also a part of me that viewed League & Championship as sufficiently different to be treated individually. Separate entities. Different games on different pitches in different weather. But then I got notions and tracked the 2018 league. Was the league data sufficiently similar to that of recent Championships allowing us to augment existing datasets and produce more robust outcomes? Or did the “gut feeling” that the two should be kept separate stand up to even the most rudimentary of reviews? In the end 22 League, and 32 Championship, games were tagged (a fancy way of saying “noted a lot of different things within a game”) throughout the year. A nice, healthy, robust possession count of just under 5,000. Given the size of the dataset, and the fact that the games reviewed were within the same calendar year, any differences should really be due to the competition, and its peculiarities, rather than any observed changes in styles throughout the years. (And as a nice aside we’ll also have a clean, comparable, dataset to test the effects, if there are any, of the new rules being introduced in 2019). At the outset it became obvious, despite the best intentions of curtailing the review to one season, that we were not comparing apples with apples. Within the 32 Championship games there were quite a few where the disparity between the two teams’ quality was very evident (somewhat expanded upon here). So the 2018 Championship returns were subdivided further into (a) all Championship games and (b) those games between Division1 teams only (Dublin, Tyrone, Galway, Monaghan, Donegal, Kerry, Kildare & Mayo) of which we had a healthy number – 15 in total – thanks to the introduction of the Super8s. And we have our first surprise. There were as many possessions per game in the league as there were in the Championship; and the differences between the two Championship subdivisions were small enough to be deemed immaterial. I say “surprise” as, based on nothing more than intuition, I fully expected there to be more possessions during the League as a result of increased turnovers through weather, heavy pitches and teams not being quite at their peak. Now there were more turnovers during the league – five a game – but this was counter balanced by how teams used the ball. There is an appreciable step up in attacking production across the Championship with higher Attack and Shot Rates. Both these then lead to noticeably more shots (~8.5%) per game. More shots equal more kickouts. Those turnover possessions “lost” from the League to the Championship were regained through extra kickouts resulting in the immaterial movement in the total number of possessions. 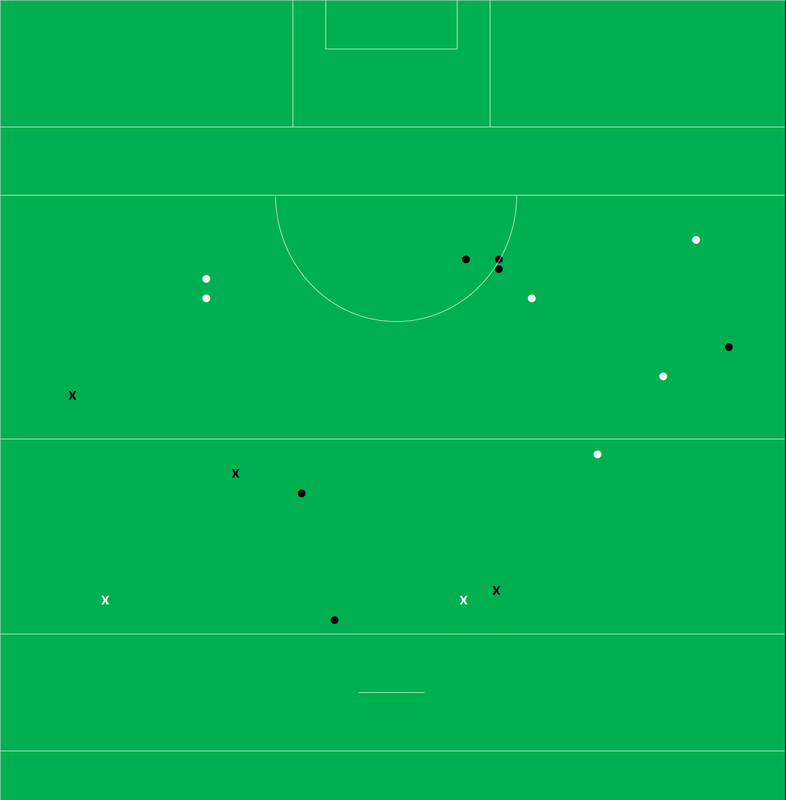 Viewing kickouts in isolation that point is further evidenced; kickouts account for 49% of all possessions in the League but 54% in the Championship. Teams were much more on point on kickouts throughout the Championship retaining possession at a much higher rate than they did during the League (77% v 70%).Teams won more short ones (95% v 91% during the league) as well as more of the longer ones (61% v 56% during the league). One of the contributing factors here could be the well-worn training cycle within GAA where teams work on kickout routines coming into the Championship as the winter months are used to lay down a fitness block. Interestingly this is the first time we see a break in how the two Championship subdivisions perform. During the league the kickout team won 56% of their own kickouts that went past the 45; this stepped up to 61% in the Championship and again to 66% when we segment just the Div1 teams. A jump in retention rates from 56% to 65% on kickouts past the 45 is quite noticeable – especially on those kickouts that should be the most contestable. The teams, and the quality of the opponent, haven’t changed. Instead teams have just improved. This stepped increase in retention rates, both from league to Championship and within the Championship subdivisions, lends credence to the above supposition that teams “work on” their kickouts more in the lead up to Championship than they do in the League with the better teams, i.e. Div1, being more successful at implementing their plans. As noted above there are more shots attempted during the Championship. But that alone does not account for the higher scoring rates observed during the summer. Teams are more efficient with that extra shooting. And not just in one particular phase but across all three – point attempts, both from play and deadballs, as well as goal attempts. Point attempt Conversion Rates (from play) during the League were lower than those in the Championship. But not massively so. They are probably within any margin of error so further work is required to confirm if this a League v Championship, early season v late season, bad weather and heavy pitches v good weather and “proper” pitches thing or just one season noise. Deadball returns have improved the last two Championships (2018 – 74.0%, 2017 – 73.5%, 2016 – 69.0%, 2015 – 68.9%) so the 72.2% achieved within the 2018 League feels like a lag. Again though it is within any margin of error so it is probably wise to err on the side of caution and say that the differences are inconclusive. Goal shots are probably the most eye catching numbers with just 32% of shots converted during the League and 39% during the Championship. Again those Championship games involving the Div1 teams saw another slight bump to 41%. The volume of goal attempts in those Championship games was less at 4.2 per game (as against 4.7 during the league) yet they were converted at a much higher rate. Why? More work done on finishing moves? Random one year fluctuations on small sample sizes? Effect of must win games in the Championship ensuring players take points off less clear cut chances? That most unsatisfactory of answers … to be determined. Instinctively the Conversion Rates for all three elements, deadballs, point attempts and goal attempts, being lower in the League feels right. As stated I have never been a fan of mixing data from the two competitions and whilst the disparities are probably small enough for some the differences just reinforce my original belief that, without further analysis, we shouldn’t just lump the two competitions together to get bigger volumes. So there you have it. At a macro level League games are similar to Championship games with the same number of possessions and comparable Conversion Rates. But get under the hood and the makeup of each component differs just enough to warrant (for me anyway) keeping all metrics for the two separate. Unfortunately there are no great defensive metrics per se. The sign of a good defensive performance is usually evidenced by the absence of good offensive metrics for the opposition. But that doesn’t really work here when we are looking at averages in the round as everything just becomes an aggregate blob with no real decipherable differences. Some specific defensive metrics we can look at are turnover rates (though the assumption that all turnovers are induced by the defence doesn’t hold much water), how often teams get in for an attempt at goal and the pressure faced by teams when shooting. Focussing on the Div1 teams we can see a tightening up on the defensive front with a ~10% increase, from the league to the Championship, in the number of shots taken under strong pressure. There is also a ~10% increase in the number of possessions it takes to get a shot on goal. As well as getting more clinical on their use of possessions and kickouts the Div1 teams also tightened up defensively (balanced by more efficient shooting). Everything trends towards the Championship just being that step ahead of the League. Sometimes what you see really is what you get. 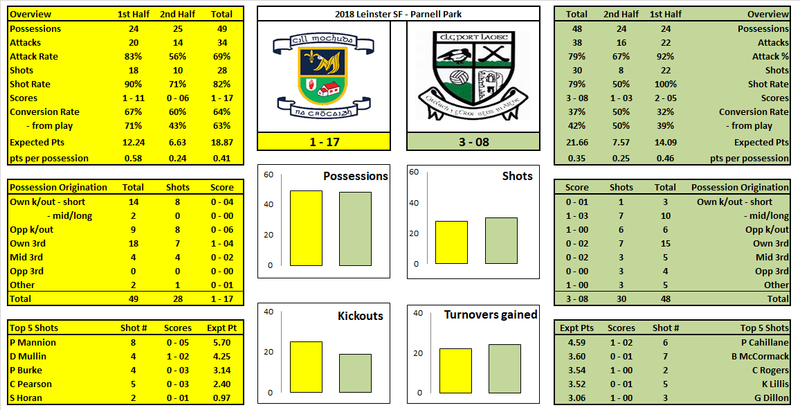 Over the 60 minutes of this game the headline numbers – possessions, attacks, shots, number of kickouts won, number of turnovers – are all very close. Yet the game never felt that close as the clock ran down. Part of Corofin’s ease in the last third was due to their excellent shooting. 71% overall including 2 – 00 from their only two goal attempts and 0 – 03 from their three frees. Their point taking stood up as well with a Conversion Rate of 58% (0 – 07 from 12; Expt Pts of +1.09). One unique aspect of their point taking was the spread of shooters. Ten different players in total contributed to their 12 point attempts with only Kieron Molloy and Mike Farragher having more than one attempt. Similarly their assists were well spread with nine different players providing primary assists and only two players (Gary Sice & Dylan Wall) having more than two. That is one of Corofin’s greatest strengths – you never know where the attacking threat is going to come from. But the main reason for their easy third was due to a devastating 15 minute spell from the 33rd minute onwards. In that period Corofin had 16 possessions taking eleven shots … and scoring 1 – 08 (Conversion Rate of 82% with an Expt Pts +3.06). They rounded that period off by winning three Ballintubber kickouts in a row, including a short one that went awry, scoring 0 – 02 from them. During that same period Ballintubber had 11 possessions with just four shots scoring 0 – 02. The effect on the game was quite dramatic. We have touched on how Corofin dominated Ballintubber at the start of the second half but Ballintubber’s paucity in attack continued on with their only two remaining shots in that half coming at the death in the 58th & 60th minutes. 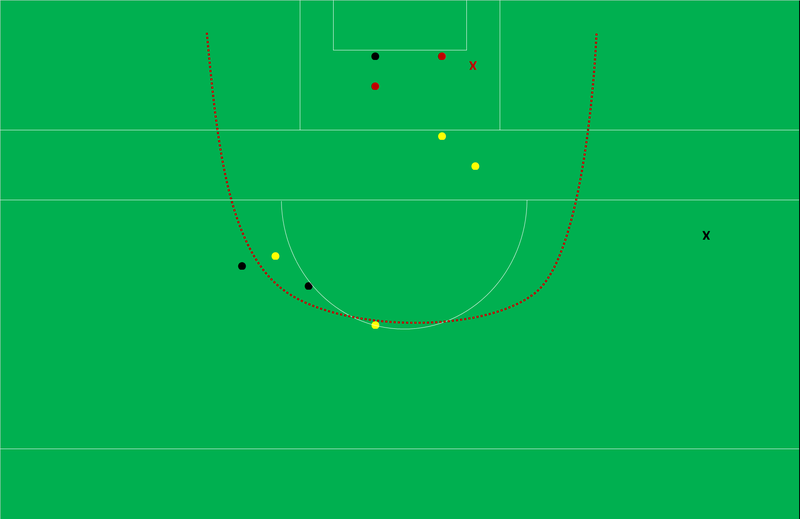 Ballintubber didn’t just rely on O’Connor & Dillon in terms of shooting. They, along with Jason Gibbons and Diarmuid O’Connor, were heavily involved in Ballintubber’s attack with the four providing the primary assist on 14 of their 17 shots. The kickout flow followed the game flow. Overall the two teams come out more or less even; 22 kickouts past the 45 with both teams winning 11 each. Indeed it didn’t matter who kicked out the ball … Corofin won half (4 apiece) of Ballintubber’s non-short kickouts with Corofin also winning half (7 apiece) of Ballintubber’s. But Ballintubber only had three kickouts in the first half with Corofin having six in the second. 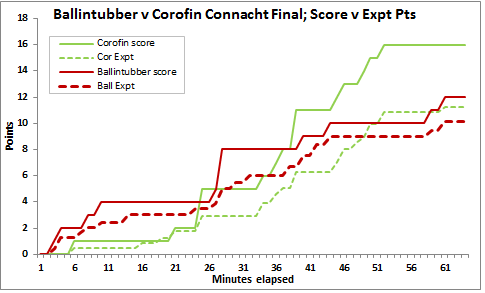 Ballintubber were able to get a grip on the game in that first half winning six of Corofin’s nine kickouts that went past the 45 including back to back Marks on Corofin’s first two kickouts. Corofin were much better in the second half winning five of their six. The last published Expected Points (Expt Pts) numbers are contained here. I would strongly recommend that everyone, whether you are currently using Expt Pts or not, (re)read this piece as it outlines the methodology used and more importantly the inherent weaknesses in the numbers. Those numbers were produced in early 2018 but had not baked in the 2017 returns … so in effect were created off Championship data up to and including the 2016 season. Some 70 Championship games have been added to the database since then so it is time to update the numbers. a) Firstly all attempts, inside Section 8, have been coded as being with the hand or the foot. This does not get anywhere near representing the quality of goal chances but, as can be seen in the differences for both, is a worthwhile change. b) Secondly the raw averages have been dispensed with and instead a weighting is now in effect; 30% of total outcomes are taken from the two most recent years with 20% each for the two years preceding this. What is happening in more recent years is more prevalent in the Expt Pts output but we spread the return across the four most recent years to ensure any one year change/blip does not completely overwhelm the model. 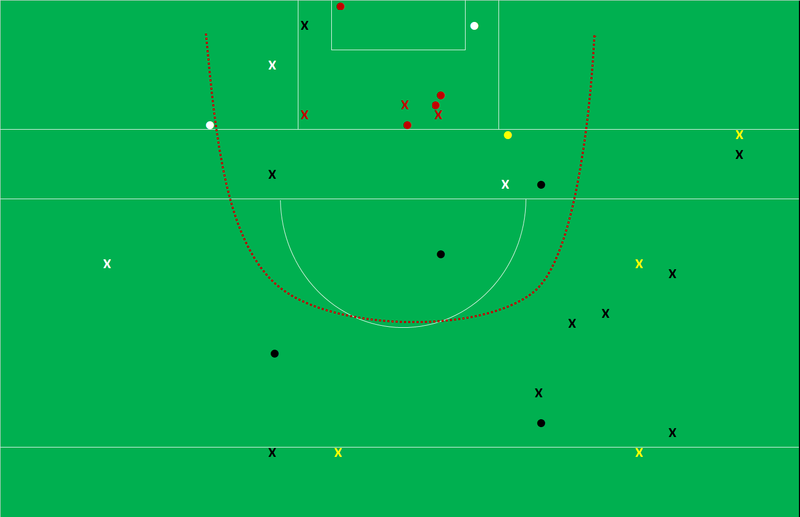 c) This is the case except for rarer shots (sideline attempts, 45s, penalties etc.). For these we take all the shots in the database rather than applying the weighting. This gives us more certainty on the numbers. As ever Expt Pts is not the be all and end all. It is another tool to use when honing in on shooting efficacy. One tool (albeit a better one than Conversion Rates). No more, no less. Consider these numbers as “Raw Expt Pts”. No overlay. No subjectivity. They are the product of the 80:20 rule. A newer model, which overlays strength of competition and game state, is currently in production. The thought behind this updated version is expanded upon here. That will undoubtedly produce better numbers but it is not necessarily something that can be transferred easily to club football. As such the numbers here are better in that respect. It highlights two aspects; firstly how utterly dominant Clann na nGael were post the red card but also, and probably more importantly, how this was no fluke as the platform had been laid in that opening 40 minutes when it was 15v15. 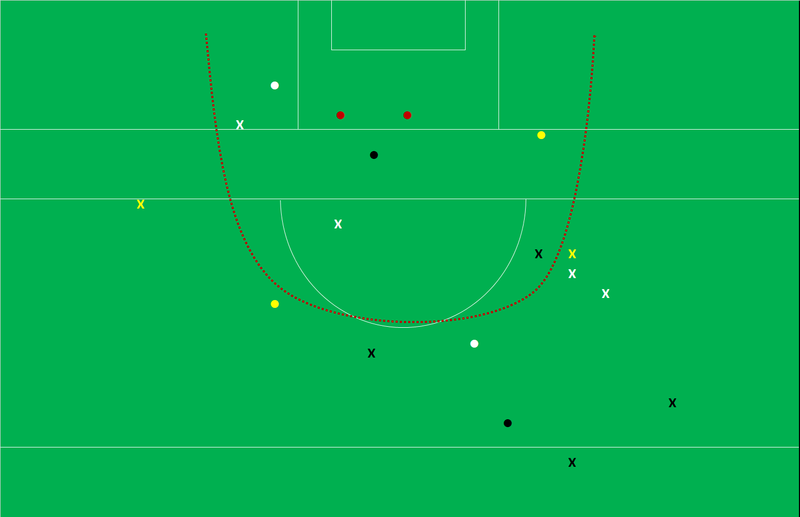 In those opening 40 minutes Clann na NGael had five more possessions and four more shots. 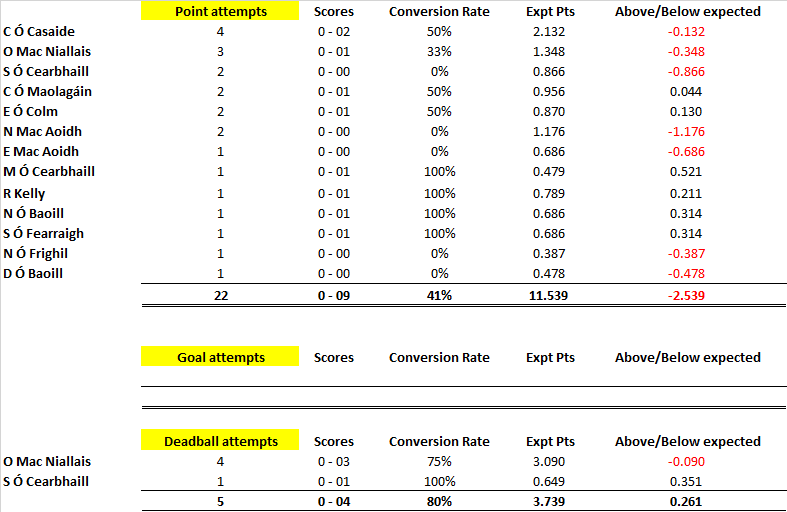 Yes at the time of the red card there was only one point in it but that was due to excellent St. Brigids’ accuracy (83% Conversion Rate at that point with an Expt Pts of +3.57) more than anything else. Once the red card came the dam burst. … they were pretty devastating. 70% Conversion Rate and 0.68 points per possession are both excellent metrics. Every part of their attacking play was functioning but the game was cracked open with two goals in the 44th minute just after Brigids had levelled the game. 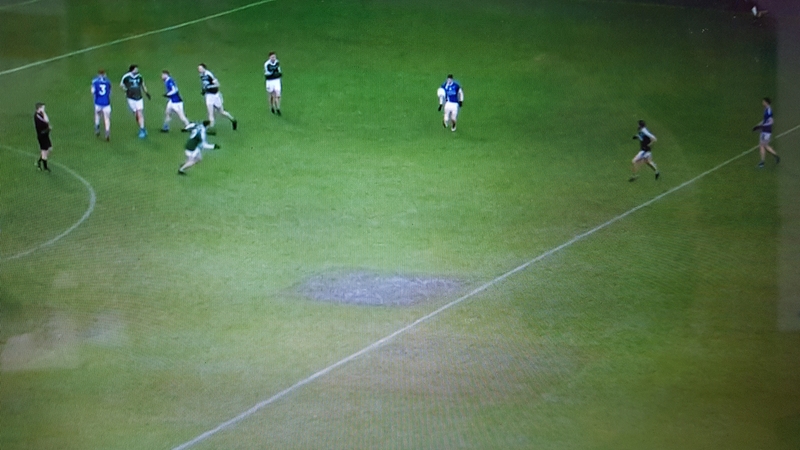 In total Clann had six shots at goal, with five different players having an attempt, returning 4 – 00 including the type of quick thinking from their sub Callinan for the 3rd goal (if anyone hasn’t seen it the clip is embedded here) which epitomised their all-round sharp display. Scoring four goals means that to lose you either need to have a calamity on your remaining shooting or the opposition need to have an absolute worldly of a game. Neither happened here. Indeed the remainder of Clann’s shooting was as good as their shots at goal returning 69% (0 – 09 from 13; Expt pts +2.7) on point attempts which included two monsters from the two Shines. Donie Shine was also exemplary from deadballs scoring 0 – 06 from 8 on point attempts (including 0 – 02 from three 45s) as well as slotting a penalty. Indeed one of those misses was from the apex of the 20m line and sideline on the right with the right. Still not entirely convinced he was even going for a point with that looking at the angle! 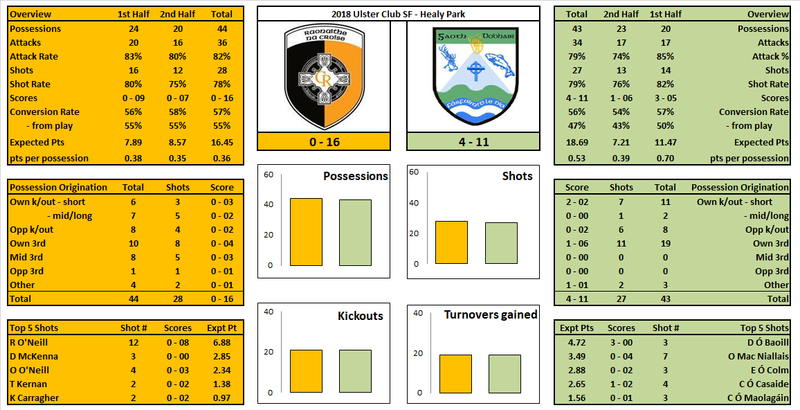 Donie scoring 1 – 07 will rightly get the plaudits but he was ably supported on the attacking front by both Lennon & Fahy who combined for 1 – 05 from just 7 shots (86%; Expt Pts of +4.0). Apart from his shooting Fahy also had a quietly effective game as the link man providing three primary assists, setting up Dunning for the pivotal 2nd goal and winning a free for Shine to convert. One aspect Clann may look at as they enter into the Connacht campaign was the fact that they got turned over six times outside the opposition’s 45. 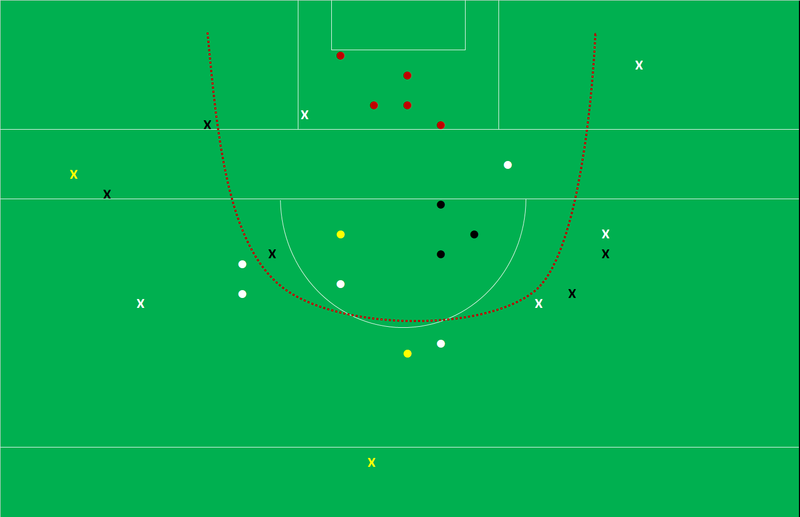 Brigids manufactured three shots and 0 – 02 from these six possessions but other teams will be more clinical. In fairness to Brigids’ attacking unit they were also on point converting 87% (Expt Pts of +4.5). Their points per possession, in isolation, at 0.45 is very good. 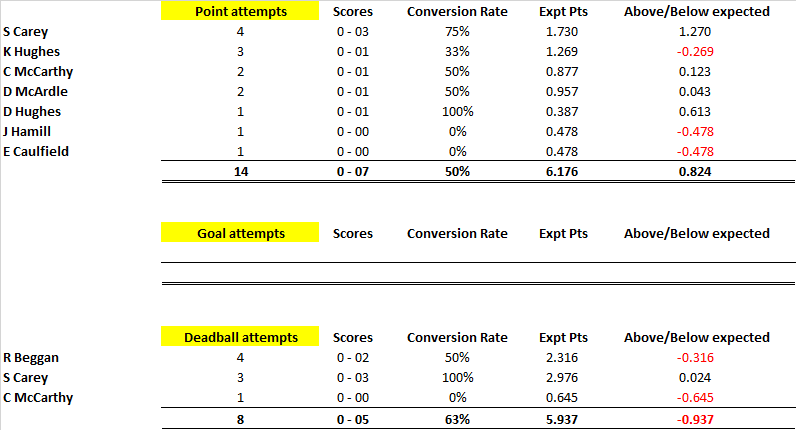 But the chasm between that and Clann’s 0.64, and the fact that they produced a lower return off an excellent Conversion Rate points to their deficiency; (a) they only scored one goal and (b) they just didn’t manufacture enough shots. 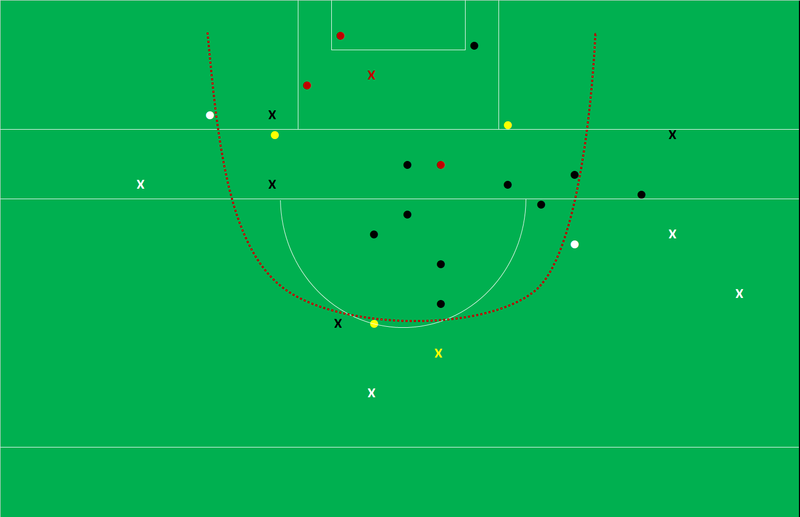 On the shot count; Brigids produced 12 fewer shots than Clann through a combination of having less possessions (33 to Clann’s 42) and a poorer Shot Rate (60% to Clann’s 82%). They were in a hole to start with by having less possessions … they then dug further by not being able to convert those possessions they progressed into an attacking position into a shot. Once they did pull the trigger they were every bit Clann’s equal with 71% (0 – 05 from 7; Expt Pts of +1.5) on point attempts, 1 – 01 from their two shots at goal and 100% (0 – 06 from 6) on their frees. Senan Kilbride was very good early doors scoring 1 – 03 from 4 shots (including one free) in the first 15 minutes however the Clann defence got on top thereafter and he didn’t have another shot from play for the entire game. Clann na nGael absolutely destroyed Brigids on kickouts. The overall numbers show Clann na nGael gaining possession on 20 to Brigids 17 with the count being 12-10 on those that travelled past the 45. Nothing untoward there you might say but it was what came off the kickouts that was decisive. Of the 20 kickouts they won Clann na Gael progressed 15 (75%) to a shot … Brigids manufactured seven shots off the 17 (41%) kickouts they won. Clann scored a barely creditable 3 – 09 directly off kickouts whilst only conceding 1 – 06.